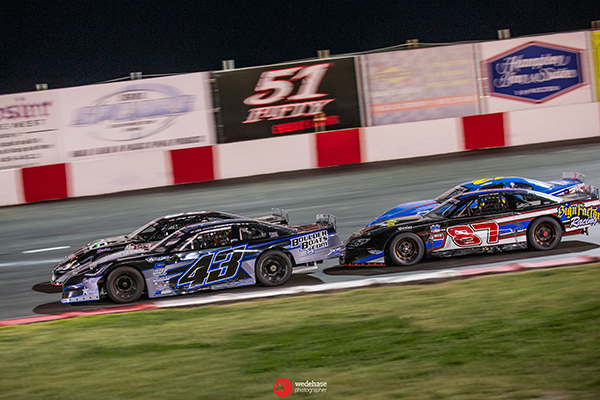 LAS VEGAS, NEVADA (April 10, 2019) – 13 year-old Tanner Reif continues to the lead the championship standings in the 51FIFTY Energy Drink Jr. Late Model Series at Madera Speedway after a runner-up finish on Saturday night. His brother Tyler also finished in the top-five in the MAVTV-televised series in California to continue his march up the standings. Tanner leads the series by three points on the eve of round #3 on April 27th at the one-third mile oval. He won his sixth consecutive fast-time in time trials with a 15.234 second lap. Continuing the theme of threes, Tyler timed in third as well. Tanner used the restart on lap six to grab the lead ahead of the 19 field in the 70 lap feature. He successfully fended off a challenge from Seth Wise while Tyler Reif battled with Joey Iest for third behind them. Tyler Reif settled into third before being turned around on lap 35. Three cars were unable to avoid him, tagging Tyler as he spun to unfortunately end their races early. Reif’s crew worked feverishly, returning to the race minus most of the front body work on the #7 Jackson Race Cars chassis. While Tyler charged his way through the field, Tanner continued to hold the top position over a number of restarts. A green-white-checkered finish between Tanner Reif and Joey Iest thrilled the crowd with Iest narrowly edging him out of turn four. Tanner’s last ditch effort resulted in an exciting slide across the finish line. Reif finished second with no harm done to the #43 Victory Circle chassis and continued his points lead. Tyler Reif avoided the numerous melees to record an incredible come-from-behind fifth place finish. Reif Racing wishes to thank its sponsors Power Gen Components, Vegas Fastener, Boulder Boats, Undaunted Apparel, CSM Graphics, Silver State Transports, Hampton Inn & Suites, AXCEL Sports, AR Bodies, Wilwood Brakes, Frank’s Radio Service, Advanced Racing Suspensions, Competition Carburetors, and Powder Coating Plus for their support.